Cotton candy is a favorite treat for young and old, so the candy floss machine or cotton candy maker is welcome at any festive occasion. 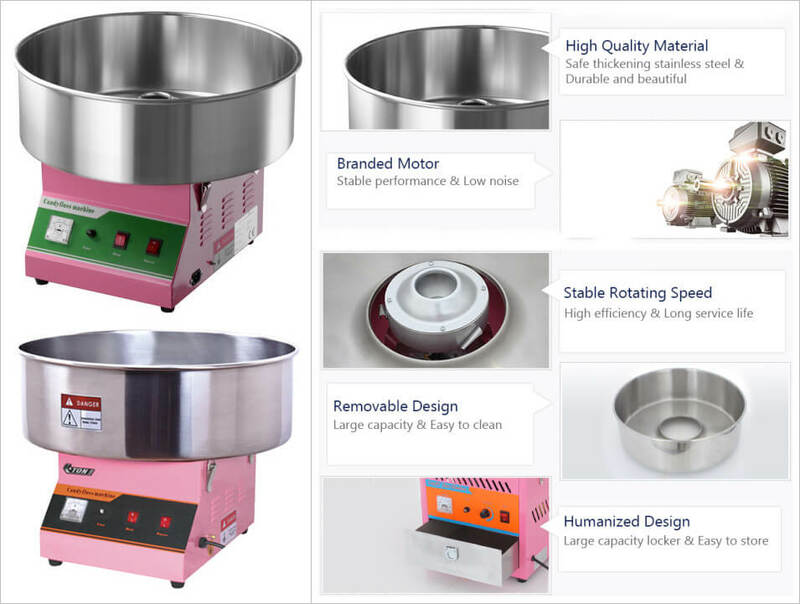 Amisy candy floss machine is designed to make various colorful and flavored cotton candies to meet the market requirements. The candy floss is mainly made of sugar and other auxiliary ingredients which makes it healthy and tasty. 1. 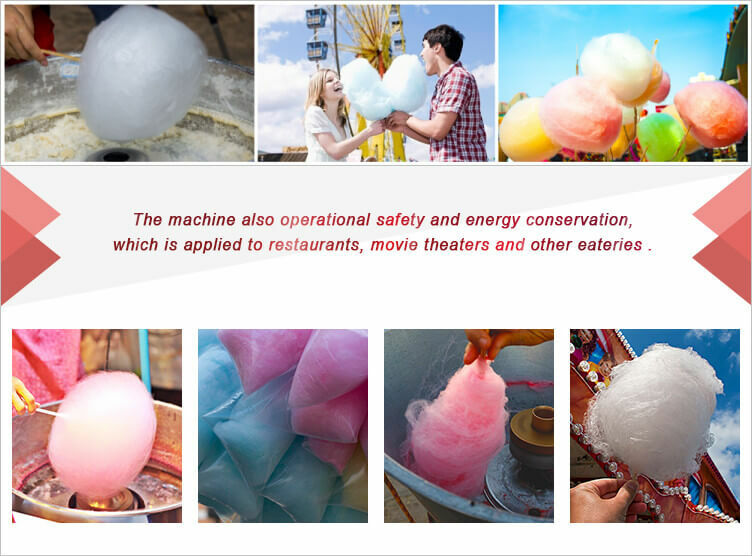 New type cotton candy machine, obtain the European Union CE certification, quality is guaranteed. 2. Elegant appearance, easy to operate and move. 3. Various colors such as red, yellow, blue, green, orange, purple and so on. 4. All kinds of tastes like apple, strawberry, peach, watermelon, leechee, mango, etc. 5. Suitable for the western-style food shop, drinking shop, Chinese food shop, kid party and catering outlets, shows and other snack shops. 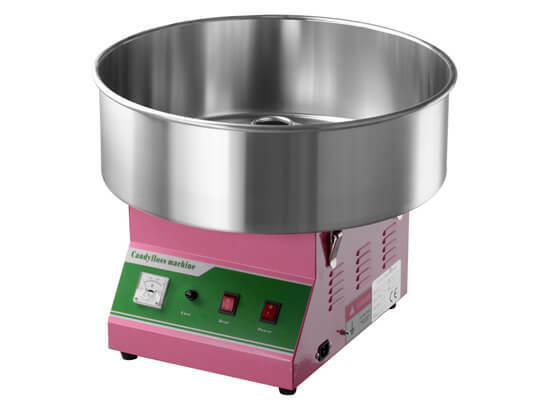 How to Use the Candy Floss Machine Cart to Make Cotton Candy? 1. Firstly, press the switch to allow the machine rotating for 1-2 minutes to observe if the machine works smoothly during the rotating process. 2. Secondly, rotate voltage adjusting knob (temperature) to observe the voltmeter, please turn to 210V-220V, and let the heating element preheat 4-5minutes. 3. Thirdly, spoon clean white granulated sugar into the rotor center, about 3 seconds, the cotton candy will be emitted; use thin bamboo sticks or other rod-shaped objects along the inner wall to rotate several times, and then place the bamboo sticks in horizontal position and cotton candy can be formed above the rotary disc rotation. 4, Last, after the cotton candy is finished, please turn off the power. 1. Select the place with a large flow of people, where there are more people, there are more business chances. 2. Do some advertising design including image ads, banners, balloons, etc. 3. Make various colorful cotton candies to attract customers. 4. If you plan to do the vending business, you'd better choose a place with a small wind which is more convenient for you to stretch cotton candy silk so as to attract more people.